Were Our Ancient Ancestors Scientifically Advanced? 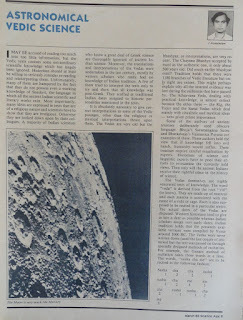 [This essay, written by the eminent Cosmologist Jayant V Narlikar, first appeared in the April 1985 issue of Science Age, a magazine now defunct, brought out by Nehru Centre, Bombay. Though the essay is almost three decades old, it continues to be as relevant as most of the criticisms on pseudoscience are. 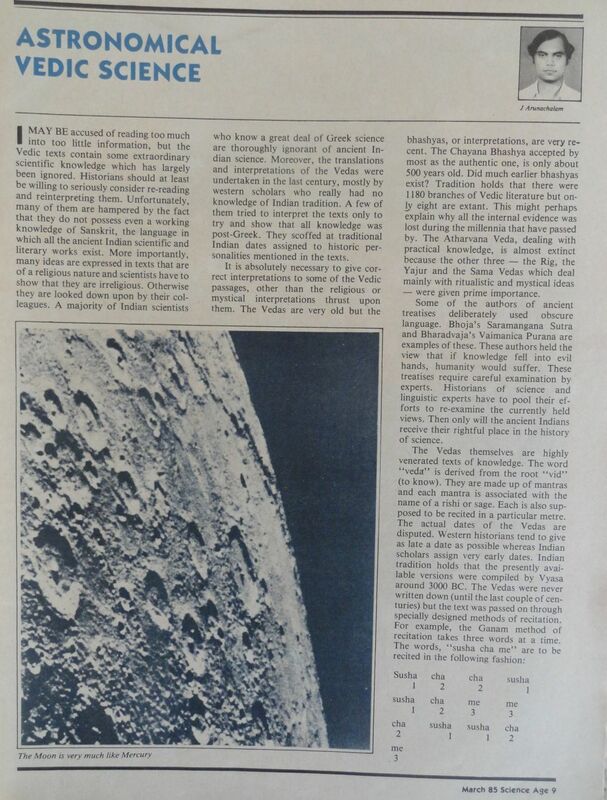 “Astronomical Vedic Science” by J Arunachalam (Science Age, March 1985) tries to show that the Vedas contain extraordinary scientific knowledge. Others believe our puranas contain descriptions of things which re scientific and technological inventions of the most sophisticated order. Was Sanjay in the Mahabharata the first TV commentator? Were the Kaurava princes test-tube babies? Were the battles in our mythology fought with guided missiles? Was the Pushpak Viman a helicopter? These are examples of technology. But were our Vedic ancestors scientifically advanced? Did they or their immediate successors employ high technology? If you believe that the answers to these questions are n the affirmative, you must prove it with scientific evidence. Let me clarify what I mean by scientific evidence. For someone to argue that an apple falls down from an apple tree (when it ripens, say, and gets disconnected from the branch) because there is a force of gravity acting on it and pulling it towards the Earth, is not enough. Not even Newton could have convinced his fellow scientists of the law of gravitation with just that observation. The law of gravitation has behind it Kepler’s meticulous analysis of observations of planetary motion, Newton’s law of motion, the mathematics of calculus; it has following it such predictions as Halley’s Comet and the discovery of Neptune. Science, in other words, is not a collection of vague qualitative statements: it rests upon detailed experiments and mathematical foundations. What is technology? It is not a folklore of extraordinary objects: it is made of detailed manuals specifying in minute details all the components that go to make such objects. Scientific evidence should produce such detailed descriptions. Take the Greek epicyclic theory. Wrong though it turned out to be, it can be judged as a scientific theory even to day by examining, say, Ptolemy’s Almagest. Detailed geometrical constructions are given the aim of which was to reproduce the observed positions of planets on the sky and to predict where to find them in future. Mr Arunachalam complains that “a majority of Indian scientists who know a great deal of Greek science are thoroughly ignorant of Indian science”. Since he talks of Vedic science, he presumably means that there exists Vedic science in such quantitative details as the above example of Greek science. Unfortunately, to date, no such detailed description has emerged. Science makes unambiguous statements based on precisely stated assumptions. Unfortunately, Sanskrit (a language which I know a little and admire a lot) is not a suitable medium for describing science. It has flexibility of syntax and meaning that can lead to many interpretations being given to the same statement. A classic example is Aryabhata’s sloka implying that the Earth revolves around an axis against a background of fixed stars. Since at the time he made the statement, and in the centuries that followed, the geocentric theory held sway, Aryabhata’s successors interpreted this sloka differently. This being the drawback of Sanskrit, statements in that language depend very much on who chooses to interpret them. Scientific conclusions are by contrast objective. When Einstein writes a paper it does not require different interpreters to say what he meant. If he wrote a paper in such ambiguous terms it would not be accepted for publication in any scientific journal. Arunachalm’s examples from ancient writings are such that they depend very much on the interpreter. Take for example his translation of the answer to where the Sun gets its energy: “the Sun gets its power from a gas, which is in unlimited quantity.” Now if modern science had found the Kelvin-Helmholtz hypothesis of gravitational energy (of contractions) as the correct answer to solar energy, this statement could be cited in support of it. This hypothesis is, however, incorrect and so the same statement could be cited (as Arunachalm presumably intends) as supporting thermonuclear energy. Further, what does the adjective “unlimited” mean? The Sun has a large but finite mass. Is this what is implied? If so, the interpretations are contrived at best. The relationship of the time span of manvantara (300,000,000 years) to the modern estimate of the Sun’s orbital period round the Galaxy is equally farfetched unless the Sun’s motion round the Galaxy is so stated explicitly somewhere. The Viman-shastra which I had once studied failed to satisfy me on either of the two counts. In terms of science, it did not give (even qualitatively) the theory of aerodynamic lift that motivates all modern planes. It did not give any alternative scientific explanation as to why planes fly. An in terms of technology it did not give a manual on how to make a plane. It is wrong to read “science” into descriptions that are not scientific texts in the first place. The Ramayana and Kumarasambhava are literary masterpieces. Let us not confuse them with such things as Principia Mathematica or Review of Modern Physics. As for the Vedas, as Arunachalam says, “traditions hold that even to misspell a word by a single letter is sin” – that is hardly the spirit of science! Had science followed such a tradition our school children or college graduates would today be reciting Alagest word for word. In the end I wish to clarify that there have been scientific text in India. The Charaka and Sushruta Samhitas give medical science as known and understood and practiced in ancient India. The works of Aryabhata and Bhaskara are examples of astronomy text which exhibit clarity (in spite of Sanskrit!). Leelavatis is an excellent example of a text in arithmetic, algebra and geometry. Thus it is not necessary to go to Western science per se for examples of ancient science writing. This makes it all the more important to find scientifically written texts of Vedic times. Until such text are found, I regret that my answers to questions in my title cannot be in the affirmative. Just because you do not understand Sanskrit you cannot say that it is not the right language to depict science. This statement is just like closing your eyes in front of a tiger and saying that there is no tiger because I cannot see it! This article is old as well as irrelevant in today's world when we are digging deeper for better knowledge and understanding. We think, Eva has misread Prof Narlikar's statement. This is what Prof Narlikar has written: "Science makes unambiguous statements based on precisely state assumptions. Unfortunately, Sanskrit (a language which I know a little and admire a lot) is not a suitable medium for describing science." What does this sentence mean? To us it means, Prof Narlikar knows Sanskrit, though he does not claim to be a supreme authority on that language. Undoubtedly, Prof Narlikar made the statement based upon his knowledge of Sanskrit. The article indeed is old though not as old as spurious claims about Vimaansastra! And, we advice Eva to read the introductory paragraph we have written while uploading this article, where we quoted Prof Massimo Pigluicci. Readers who wants to read an updated version of this article may buy Prof Narlikar's book "The Scientific Edge" published by Penguin Books in 2003. Carvaka , in your explanation on Aug 2 you have said that English language also can be misinterpreted. So how English is better than Sanskrit for scientific texts? Anonymous, it's a good point. However there is a difference. 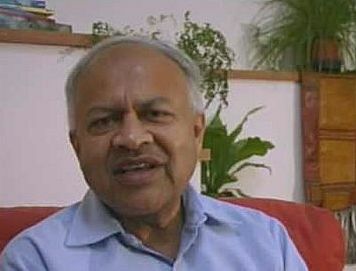 According to Dr Narlikar, Sanskrit "has flexibility of syntax and meaning that can lead to many interpretations being given to the same statement". Thus, according to Dr Narlikar, it is Sanskrit's inherent flexibility of syntax and meaning that leads to ambiguity in interpretation. Since I am not a linguist, I have nothing more to say on this aspect. My inability to comment on this aspect is compounded by the fact that I (the administrator of this website, not Dr Narlikar) do not have any knowledge of Sanskrit. It is not that she does not know the difference between "a little" and "little". As I said, perhaps she was in hurry! It however needs to be admitted that every human language has its inherent limitations. On that point, I agree with Anonymous. I am stunned! "Boxed-in", is all I can say to Dr J V Narlikar, and I say that with a fair amount of shame for the following reasons:- I can not think of anybody else, least of all a scientist, being so badly regimented - while he pretends to favour open minded innovative science and methodology, he continues to hold firm opinions about how science is done, and what a society which uses science and technology should do (in addition to using the technology). Why should anybody feel the need to document anything for investigators of the future if one has been using it as a matter of routine? Think - do we have "how to build an aircraft" manual, alongwith all the aerodynamics, material science etc etc, saved in a chest to survive, say, a nuclear war or great flood (whatever) so that some one who comes later can know how good one was? Rubbish. There is an inherent flaw in always seeking evidence, and building one's case upon knowns. I expect a scientist to know what it is! In any case, ancient Indians need prove nothing. Can modern 'scientists' disprove the claims of the stupid non-scientists and ignorant non-mathematicians, please? When somebody makes extra-ordinary claims (such as existence of aeroplanes in ancient India), they should have sufficient evidence - solid proofs, not fantasy tales. "m" says: "In any case, ancient Indians need prove nothing. Can modern 'scientists' disprove the claims of the stupid non-scientists and ignorant non-mathematicians, please?" A good piece, with a major flaw.I think Prof Narlikar steps on very slippery ground in asserting that any language- in this case Sanskrit- is 'unsuitable' for scientific statements! This is as bizarre & Unscientific as the tall claims of the 'Vedic science' wallahs. We should be honest enough to acknowledge this flaw instead of trying to 'interpret' it.